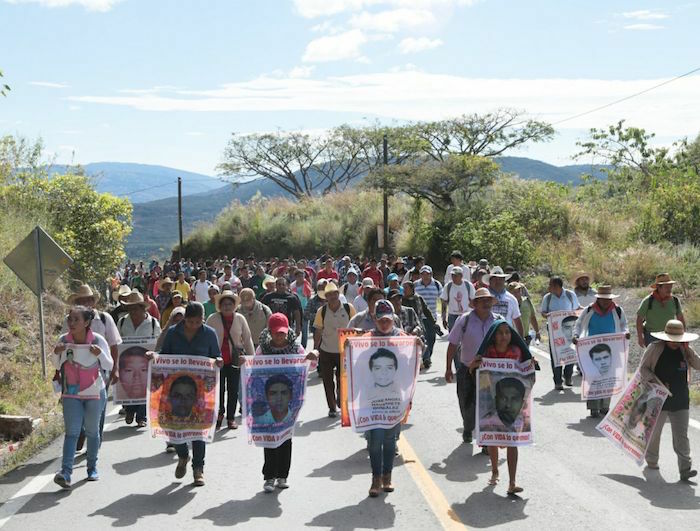 On 12 December, relatives of the student-teachers from the Ayotzinapa Rural Teachers College, Jorge Alexis Herrera Pino and Gabriel Echeverría de Jesús, who were killed during a police operation carried out by state and federal agents in December 2011 in Chilpancingo, Guerrero, together with Gerardo Torres Pérez, a student-teacher victim of torture, denounced the Mexican State before the Inter-American System on Human Rights due to the violation of its basic obligations as stipulated in the American Convention and the Inter-American Convention to Prevent and Sanction Torture. The same day, student-teachers and relatives of Gabriel and Jorge Alexis took over the streets of Chilpancingo to arrive at the same place where the crimes took place. On 11 November, 8 buses carrying about 150 student-teachers from the Raúl Isidro Burgos Teachers College were stopped by federal, state, and ministerial police as well as the military on the highway between Chilpancingo and Tixtla. According to media, the police attacked the buses three times, leaving 20 students injured and requiring hospitalization, while 8 of these have been seriously injured, and 13 arrested. According to the Tlachinollan Mountain Center for Human Rights, “the units of the different police corporations treated these students cruelly and inhumanely,” detailing that “approximately 5 of these students had their pants forcibly removed by state and ministerial police and were told obscene things and threatened with torture, while others were beaten over the head.” Beyond this, one of the arrested student-teachers who has been released declared that “there is a comrade who has had his leg broken, while another had his lips split by a kick to the face, and others were burned with cigarettes after having been arrested. I was strangled with a scarf and they had me hanging.” In this way, there is information that the police shattered the windows of the buses, fired tear-gas grenades, trapped a group of 7 students in a bus using four gas-grenades, thus preventing their exit for 20 minutes. The students in question were arrested just after escaping. In reaction to these attacks, some of the student-teachers fled to the mountains. At first, there were reports that 20 students had been disappeared, but these were presented with life at midnight. Beyond this, thanks to social pressure, the arrested were transferred to the Human Rights Commission of Guerrero State, where their injuries were certified, and after which they were released. 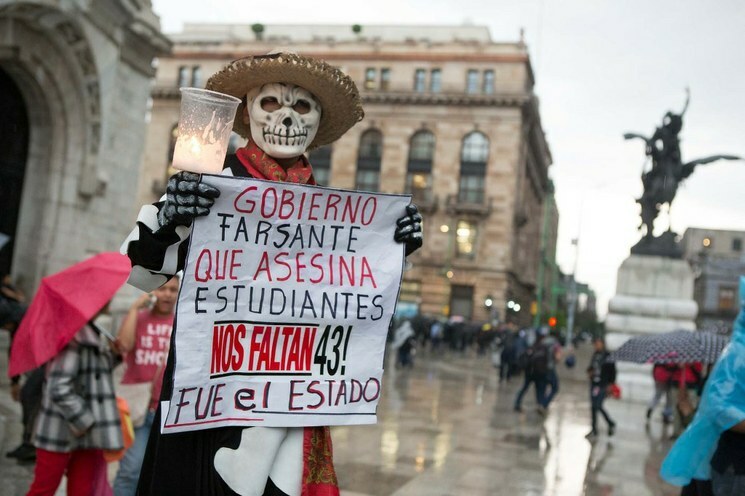 There have been several marches to reject the violence exercised against the students, such as one that was led by relatives of the 43 student-teachers disappeared on 26 September 2014 together with 500 other student-teachers from Ayotzinapa. For its part, the United Front of Public Teachers Colleges of Guerrero State (FUNPEG) announced the suspension of its dialogue with Governor Héctor Astudillo Flores (PRI), in response to the repressive action. Some of the protests have joined the rejection of the educational reform and the assessment of teachers. On 26 June, nine months after the forcible disappearance of the 43 students from the Rural Normal School of Ayotzinapa, Guerrero, parents of the youth and other groups mobilized in Mexico City, carrying out a rally and an artistic event of 43 hours in length that included poetry-readings and theater next to the Bellas Artes (Fine Arts) Palace. Felipe de la Cruz, the spokesperson for the movement of relatives of the disappeared, said that “just as we have remained firm from the beginning, so will we continue until our youth appear with life.” “We tell you, State, and we say to you that we will be the pebble in your shoe, because we are not going to be silent, and we are not going to stop on our path […]. We will not stop struggling until our sons are presented with life,” said another relative of the disappeared. Also in Chilpancingo, Guerrero, many social organizations united their demands toward the presentation with life of the youth, and they took to the streets to demand justice. Using slogans such as “Down with the State!” and “Investigate the military!” protestors also carried banners denouncing military harassment and educational reforms. On 17 June, Proceso reported that one of the 43 disappeared students was an active soldier. Previously, a journalist had requested information from the Ministry for National Defense (SEDENA) inquiring into whether any of the disappeared students had been an active soldier. 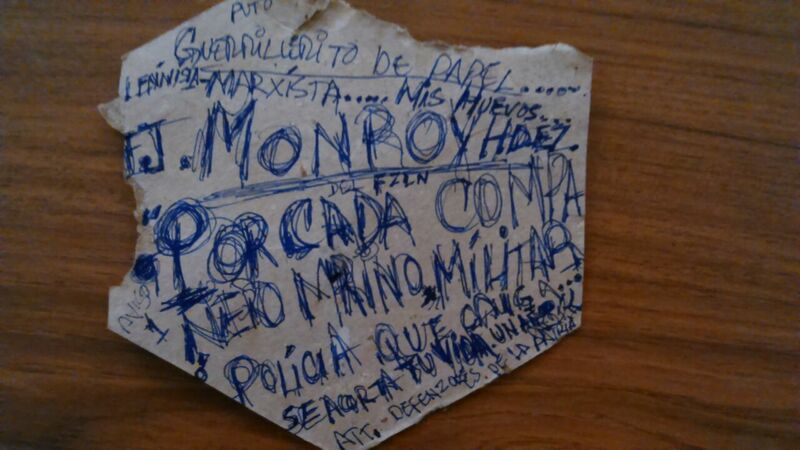 According to the editors, this approach had to do with “a line of investigation regarding the degree of infiltration o the State within the Raúl Isidro Burgos Rural Normal School, which is considered by the political authorities to be a ‘fountain of guerrilleros.” SEDENA responded by saying that “we have found one person whose name corresponds to one of the 42 disappeared students from the Isidro Burgos Rural Normal School, following your request; however, the name is classified to protect personal data.” Amidst this revelation, relatives of the disappeared stressed that this “shows clearly the military’s responsibility” in the case. Subsequently, on 26 June, personnel from the Federal Attorney General’s Office (PGR) visited the municipal landfill of Cocula, where in October of last year a clandestine mass-grave was discovered. Beyond this, the command of the Iguala Preventive Police was shuttered, with no further information provided regarding the aim sought by this move. The organization could not tell if this was a joke, but it is not the first time that its member receive threats of this sort, as accompanied by actions and slanderous charges against the activists. Beyond this, it stresses the type of support it has provided to the parents and students of the Raúl Isidro Burgos rural normal school of Ayotzinapa, and the accompaniment it has given to the victims of social violence from the Committee of Relatives and Friends of Kidnapped, Disappeared, and Murdered in Guerrero for seven years. TADECO recalls that in 2009 there was a similar campaign of death-threats and harassment communicated by telephone that was resolved with the support of other organizations, in light of the incompetence of the State Attorney General’s Office. 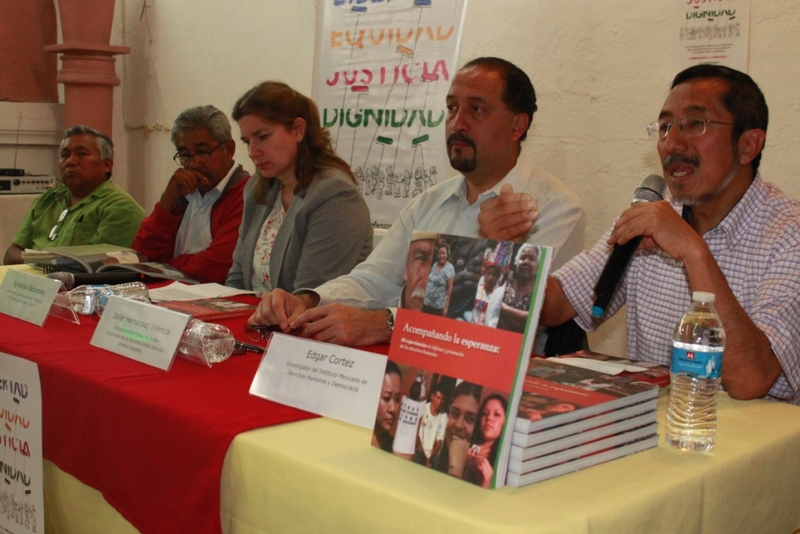 On 10 February in Chilpancingo, Guerrero, there was held a book presentation of “Accompanying hope: 20 experiences in defense and promotion of human rights,” which forms part of the campaign “Let us defend hope” as promoted by the Network “All Rights for All” (TdT). On the panel for the presentation were the following persons: Javier Hernández Valencia, representative in Mexico of the UN High Commissioner’s Office on Human Rights; Edgar Cortez, from the Mexican Institute for Human Rights and Democracy; Abel Barrera Hernández, director of the Tlachinollan Mountain Center for Human Rights; and Agnieszka Raczynska, executive director of TdT. All speakers agreed on the gravity of the situation of those displaced by violence in the state. The TdT Network also reiterated its concern for the situation faced by human-rights defenders in Guerrero, given that amidst a generalized situation of violence, this state has registered the highest number of attacks (including murders) against rights-defenders in Mexico. “These communal defenders are those who, in the majority of cases, find themselves at greatest vulnerability of being criminalized, repressed, and above all delegitimized, especially when their communities organize themselves against private interests comprised of powerful groups that promote developmental models that are foreign to the vision of local peoples or who impose violence and fear,” noted Edgar Cortez. 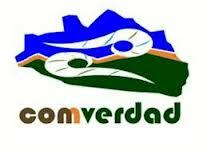 On 29 January, the president of the Truth Commission (Comverdad), Enrique González Ruiz, denounced that the human-rights defender Pilar Noriega García and the ex-guerrillero Nicomedes Fuentes García, both of themmembers of the Comverdad, were subjected to an attack on 28 January on the federal highway between Iguala and Chilpancingo, on the outskirts of the latter city. Two trucks carrying armed men approached the Comverdad vehicle in which Fuentes and Noriega were traveling, and the former requested the latter to stop. They stopped in a hilly region and then abandoned the vehicle, fleeing into nature until the following day. 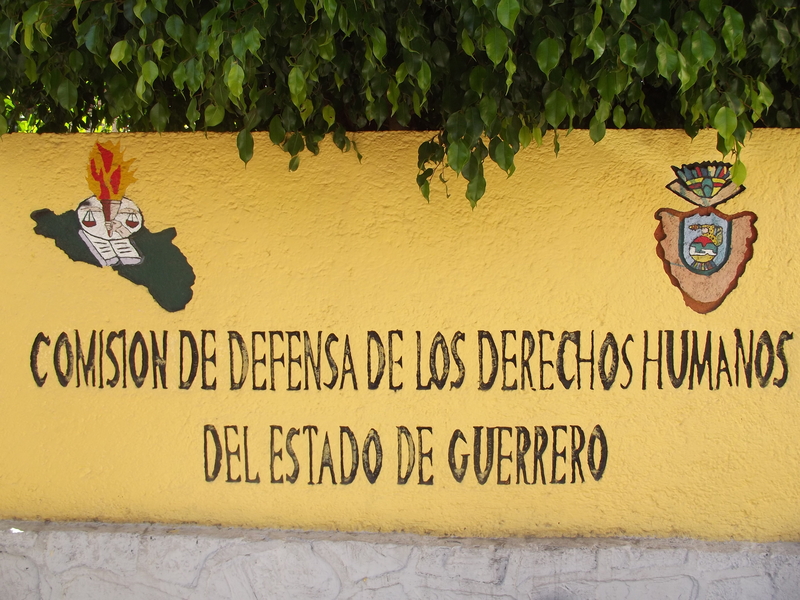 A penal denunciation was submitted to the Guerrero State Attorney General’s Office. In light of these acts, the Commission for Human Rights of Mexico City demanded that the federal and Guerrero state governments to create the necessary conditions for rights-defenders like Pilar Noriega and Nicomedes Fuentes to be able to continue their work securely. The nomination made by Governor Ángel Aguirre Rivero of Ramón Navarrete Magdaleno as head of the State Commission for the Defense of Human Rights (Coddehum) has generated debate and discussion among representatives of different parties. The Technical Council, the maximum organ of this institution, had designated Hipólito Lugo Cortés as interim president following the death of Juan Alarcón Hernández. The governor then removed him and nominated the regional visitor of Acapulco, Ramón Navarrete Magdaleno, to the position. This action was interpreted by the Technical Council as an interference from the executive branch. From Ometepec, Ramón Navarrete Magdaleno previously worked as regional coordinator for human rights in Acapulco. Interviewed on radio, Lugo Cortés noted that the executive has the right to remove and nominate functionaries and employees “only in the executive branch [itself], not in Coddehum, such that there can be no violation or attempted violation of the autonomy and independence of this human-rights defense group.” Cortés noted that, if the governor were the one to nominate the president of Coddehum, “what faith could a citizen have who has been affected by an act emanating from the government, when this government runs the very office to which he might present a complaint?” Juan Alarcón Hernández, the first ombudsman of the country, died on the evening of Wednesday 11 December in Chilpancingo, due to stomach cancer.